PING has a new home for their “True Roll” (TR) groove technology. 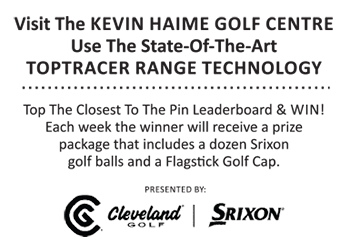 It has landed in the face of a new version of their Nome putter, a model made popular last year with the success PGA TOUR staffer Hunter Mahan. The Nome® TR™ putter features variable-depth grooves milled directly into the face. The company says the technology provides more consistent distance control off all areas of the putter face. The grooves, which first appeared in the face insert of the Scottsdale® TR series, are deepest in the center and get shallower toward the perimeter to deliver consistent ball speeds, whether the ball is struck in the center of the face or toward the heel or toe. Distance control, PING says, has been virtually off the charts. Research with this technology shows a nearly 50% improvement in ball-speed consistency when measured across nine points on the face. The 350-gram Nome TR has a non-glare matte-black body, white alignment bar and contrasting black sightline to make aiming easy. It is milled from high-grade aircraft aluminum. Its high MOI and extreme forgiveness come from the balance of a lightweight head and perimeter weighting in the form of tungsten-composite sole weights. As part of PING’s Fit for Stroke™ system, three different shaft bends are available to fit Straight, Slight Arc, or Strong Arc putting strokes. The new Nome TR model will be heading for local golf stores and pro shops in Mid-May.